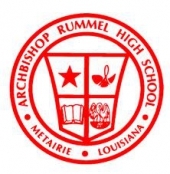 Archbishop Rummel High School, located in Metairie, Louisiana, is a coeducational school named after Archbishop Joseph Rummel. The school received the prestigious Blue Ribbon Award in 1989. Athletics has been a part of the school's history and many past students have established themselves in the athletic scene of the country. The school has the nickname of Super Ants and is accredited to the Southern Association of Colleges and Schools.